My screensaver Maker can create a slideshow screensaver in seconds.It's the ealist of use Screensaver Maker in the world.Only by select the photos you like,you can make your slideshow screensaver quickly. Click the "Image screensaver" button (marked with "1") in the left of the windows in the picture above,Set the Image tab actived by clicking the "Image" tab head ,marked with "2" in the picture. 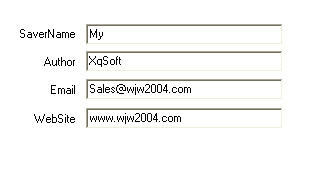 Click the "Add image" button (marked with "3" in the picture) to select and add pictures(Jpg/Jpeg,bmp,icon,emf,wmf) that you want.You can use the button "up" and "down" to modify the picture's order, if you want to remove pictures from the list, please set the picture that you want to remove in the list and the click the button "Remove". Set the Music tab actived by clicking the "Music" tab head ,marked with "1" in the picture above. Click the "Add Music" button (marked with "2" in the picture above) to select and add music(mp3,mid,wav,wma) that you want.You can use the button "up" and "down" to modify the music's order and remove the music from the list by click the button Remove". Click the button "Play" and "Stop", you can play and stop the music selected. 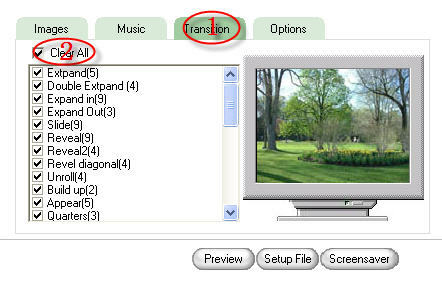 Set the Transition tab actived by clicking the "Transition" tab head ,marked with "1" in the picture above.You can modify which image transition will be shown in the slideshow screensaver, for example, if you want the "Extpand(5)" to be shown in the slideshow screensaver,just set it to be checked, the number "5" means there is 5 transtions of "Extpend(5)", they will be shown in random in slideshow screensaver. 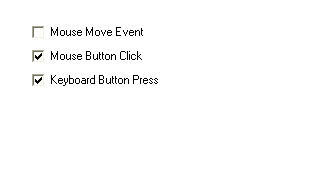 Click the Items in the list, the "screen" in the right will display the transition effect that you hav selected. Also you can customize more options in slideshow screensaver,such as the background music, the image transition effects,etc. Interval: It is the number of seconds that the screensaver delays before it displays next image. Image Size:It is setup the image display mode. 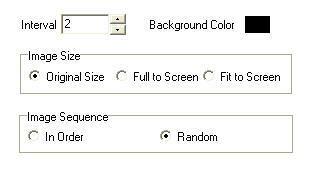 Image Sequence: Radio button let you choose whether display images in their normal order or in a random order. 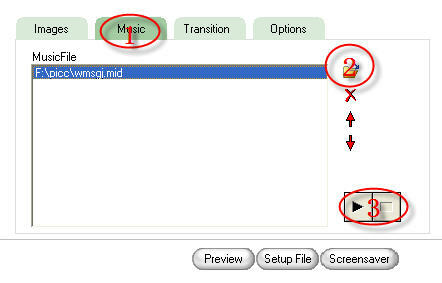 In this page you can modify how the music that you select will be play. If you choose "In order" the music will play in the order in the list. If you choose "random",the music will play in a random order.